Whitman Laboratories are a leading cosmetics manufacturer who are a centre of manufacturing excellence for market leaders such as Estee Lauder and Clinique. The Petersfield based organisation asked Hampshire Mezzanine Floors to design an external grade access platform to take significant high loads accessed from their existing loading bay area as they required large plant to enter their building at first floor level. Hampshire Mezzanine Floors, who have been industry leaders in mezzanine floors for over 26 years came up with a specially designed mezzanine, with top suspended main beams to enable the mezzanine to fit within the existing sloping roof of the loading bay. The steel work had to be hot dipped galvanised finished first and then top coated with a paint system to blend in with the colour of the existing building. Due to the very high point loads involved, HMF had to excavate through the existing concrete slab of the building and cast pad foundations through an existing tiled stairway to enable the columns of the mezzanine to be positioned discretely. The mezzanine was pre-manufactured away from the site and assembled at Whitman Laboratories on the ground. 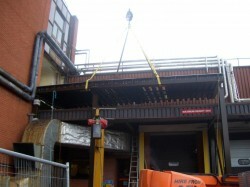 HMF then used a 50 tonne crane to lift the columns constructed from heavy duty universal section into position. Once these columns were positioned and levelled, the complete mezzanine was lifted by the crane onto the support columns and then carefully secured to the columns. Next, HMF fitted galvanised and hand and knee rail to the perimeter of the mezzanine floor. The top of the pad foundations were then concreted back in to hide the base plates and HMF then re-fitted the ceramic tiles. HMF had to prop the existing curtain walling windows of the building and fit supporting steel work to hold the top section of windows in place. Then, HMF fitted new powder coated full glazed aluminium double doors to enable the plant to be moved from the external mezzanine floor into the building. HMF as main contractor were responsible for all the elements on the project, including diamond cutting, building works, structural steelwork, electrical and mechanical modifications, cladding, roofing and last but not least, the heavy duty mezzanine floor. 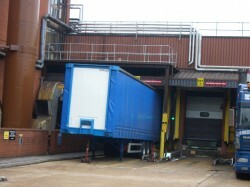 The work was completed out of hours to minimise disruption to Whitman Labs and completed on schedule. As main contractors, Hampshire Mezzanine Floors will take on the complete redesign of your premises and then provide an itemised quotation for all the elements required. HMF will undertake full Planning Applications for any external or change of use and also administrate the Building Regulations Application on your behalf.